Key Verse: Verse 5 – "Peter therefore was kept in prison: but prayer was made without ceasing of the church unto God for him." The story of Peter’s imprisonment and ultimate release as a result of prayer shows that prayer can accomplish the impossible. There is a story that comes from the mission fields of Africa. The Hubers, missionaries to Africa, had a five year-old and a five month-old child. They were also caring for several native children. Their supply of dehydrated milk was exhausted. They knew the children would suffer malnutrition without the milk. They decided to read Scripture and pray over the matter. It was coincidental, humanly speaking, but they were Divinely directed of God to read Proverbs 27:27. “And thou shalt have goats’ milk enough for thy food, for the food of thy household, and for the maintenance for thy maidens.” Mrs. Huber asked if there could be a personal message in the verse to them. They both agreed it would take a miracle of God since there were no goats in that part of the world. 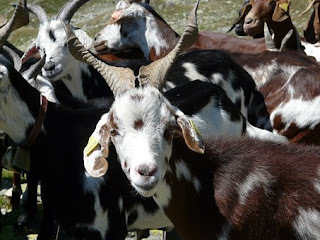 The next morning, however, they were awakened by a man who informed them he had a large herd of goats outside the village that had been brought more than fifteen hundred miles. He told them there would be milk in abundance for everyone who desired to have it. Doesn’t it stand to reason, if God owns the cattle on a thousand hills, He would also own the goats? And He does, you know!! ✞ See what God can accomplish through your prayer life.